Actors spend their lives being defined by other people: the characters they play, the directors who shape their performances, the photographers who light them, the journalists who analyze them, and the fans who love them. Angelina Maccarone’s documentary Charlotte Rampling: The Look gives the acclaimed British actress an opportunity to turn the tables. Maccarone provides the frame, but Rampling fills it, talking about her life and art, and giving her opinions about aging, beauty, sexuality, passion, and pretense. Rampling knows she was fortunate to be born photogenic—with heavy eyelids that give her a look of perpetual world-weariness—but she’s tried to capitalize on her good genes by taking on controversial roles in movies like Georgy Girl and The Night Porter, then throwing all of herself into a project. She takes these gigs seriously. Charlotte Rampling: The Look also takes itself seriously, perhaps too much so. Maccarone describes the film as “a self-portrait through others,” and combines clips from Rampling’s films with footage of Rampling conversing with friends and collaborators like photographer Peter Lindbergh and author Paul Auster, all of whom seem to share her preoccupation with whether beauty and talent fade with time. There are very few light, casual moments in The Look; even when Rampling pops into a deli to buy a sandwich, we hear her in voiceover talking about her demons. An hour and a half of this is frankly exhausting. But it’s fascinating, too. The best segments in Charlotte Rampling: The Look have less to do with the actress’ musings on life and death and more to do with her exploration of artifice. In one scene, she sits in a boxing ring with her son—director Barnaby Southcombe—and performs an acting warm-up exercise that sees them repeating lines back to each other in different tones, until they work their way into an actual conversation. 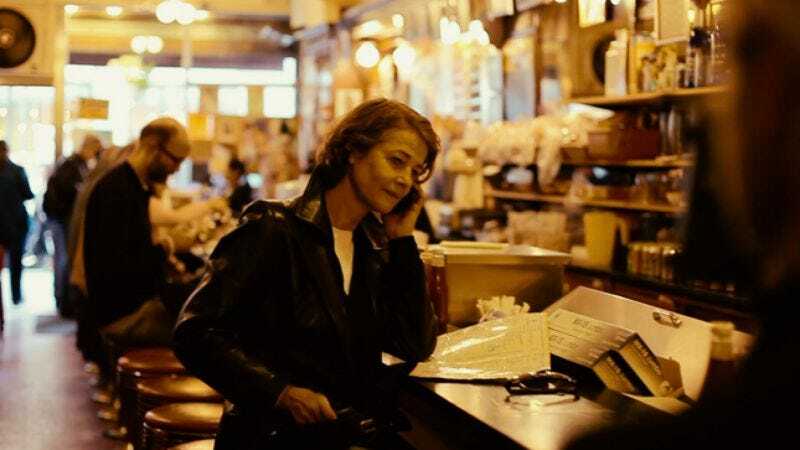 Maccarone includes moments when Rampling objects to a line of questioning or a distracting crew-member, and the director seems to actively encourage viewers to consider where the camera is when it just “happens” to catch Rampling hailing a cab or walking into a shop. Even when Rampling is being “herself,” she’s aware of how she appears. Such is the curse of a person who spends her life on film.